Established in the year of 1989, Y.K. Enterprises is listed among the most prominent organization of the industry involved in Manufacturing, Exporting, Distributing and Wholesaler wide assortment of Valves and Traps. 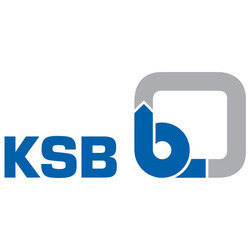 The product range offered by us includes best quality KSB Gate Valves, KSB Valves, Pennant Thermodynamic Steam Traps, Inverted Bucket Steam Traps, Ball Float Steam Traps, Gate Valves, Ball Valves, Ball Valves, L&T Valves, Kirloskar Valves, Pennant Valves, Safety Valves, Sight Glass. These products are highly demanded and appreciated by a number of clients owing to their optimum performance, hassle-free working and longer functional life. Offered products are designed and fabricated by considering optimum quality components in accordance with the laid industry standards and norms. Moreover, our clients can avail these products from us at leading market price. 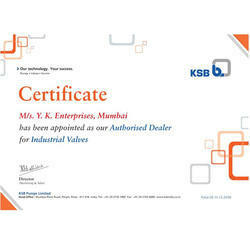 We deal with various brands like KSB, L&T, Audco and Pennant. We have established a well-equipped infrastructure facility at our premise to design and manufacture our offered products as per the set quality parameters. We have installed highly advanced and upgraded machines at our production unit which enable us to produce our offering with a better production rate. For the purpose of our business execution as per the ongoing market trends and developments, we have recruited a team of well qualified and skilled professionals. Our professionals possess years of industry experience and rich knowledge of this domain. They are working as a team to ensure trouble-free and outcome-centric environment. We have developed a well-connected distribution network, which enables us to deliver the offered products on time at client place. Apart from this, we are exporting these products to African countries, Far East and The Middle East countries. Under the valuable supervision of our mentor Mr. Khozema Johar, we have been able to touch the peak of success in short span of time. Because of domain expertise, we have huge customers across the nation. Trading of Cast and Forged Steel Valves. In the year 1989, Y K Enterprises started working in a single business operation. We are a fast growing trading company and have our offices in Mumbai, Maharashtra, India. The perfect combination of knowledge of the Industrial Machinery domain and years of experience in this market has enabled us to become leaders in the valve industry. We are certified traders of Industrial valves that are widely used to the oil & gas, nuclear power, chemical and fertilizer industries. Our team of professionals delivers only premium quality products in the market. In addition to this, we are well equipped with all the technologies and tools. Our talented team allows us to distribute end to end valve solutions specially catered to user’s need and requirements. Our organization is supported by qualified and skilled professionals. With the help of these skilled employees. We are growing at a constant rate in this domain. Our professionals are working with full dedication and support to achieve the set organizational goals and objectives. All our employees are selected on the basis of their previous working experiences and knowledge in this domain. To polish the skills of our professionals, we provide them regular training and workshops on latest domain developments. We have constructed a well-equipped and highly advanced infrastructure facility, to store our offered products as per the modern market trends. Each unit is handled by our highly efficient workforce. We have installed highly advanced and upgraded machines at our sales units, which enable us to sell and serve more efficiently.